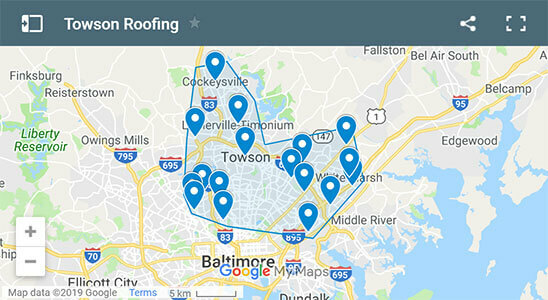 Our team at Towson Roofing is a locally owned roofing contractor located in Towson, MD and the surrounding area. We have years of experience providing complete roof replacement services for both residential and commercial property owners. We are fully licensed and insured by the State of Maryland and can work directly with clients to deliver the exact roof the want and need. Our technicians are committed to providing a 100% satisfactory customer experience. In this competitive market home and business owners expect two things: quality service and value that they can depend upon. Our professional roofing company assists home and business owners in finding a balance between the style and cost of the materials for their roof. 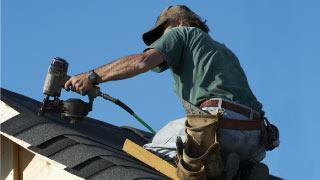 We have experience installing everything from premium shingles and slate roofing to metal roofing. 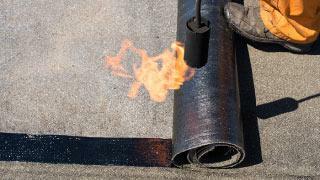 We also have experience working with flat roofing and tar based systems for protecting the roofs of business. Our advantage over our competitors is that we use our very popular and cost-efficient CertainTeed & GAF roofing products and systems. We have every type and style of roofing at our disposal and offer free estimates to help you determine what your roof needs. 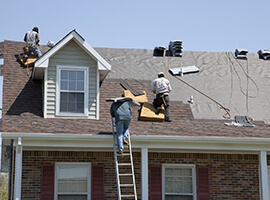 Our team at Towson Roofing offers complete roofing services for both residential and commercial property owners. We have the experience you need to perform repairs, install new roofing, or replace existing damaged roofs. Our team offers contracts for new construction, existing homes, and commercial buildings. We cover all of the aspects of roofing projects for business owners including the installation of flat roofing and tar-based roofing materials. As a homeowner, it is your job to make sure that your home looks great and is protected from top to bottom, inside and out. This means that when it's time to get a complete roof replacement, it really isn't a project that you can delay for very long. After all, your roof's main responsibility is to keep external elements out, including rain, snow, ice, wind, and cold/hot air. Our Experts at Towson Roofers provide inspections, repairs, and installation services for commercial properties. We understand that it's a big decision to make when it comes to choosing the right contractor for the job. This is why our experts make the process as easy and convenient as possible throughout the project. They provided a prompt appointment, arrived right on time, and took care of the roof repair work quickly. Our service area consists of many cities and towns in surrounding areas of Maryland, including Towson, Brooklandville, Carney, Central Park Heights, Cockeysville, Hampden, Lutherville-Timonium, Mt Washington, Nottingham, Overlea, Parkville, Perry Hall, Pimlico, Roland Park, Rosedale, Rossville, Whitemarsh.